One of the most mysterious yet powerful aspects of Facebook Advertising is the bidding system. 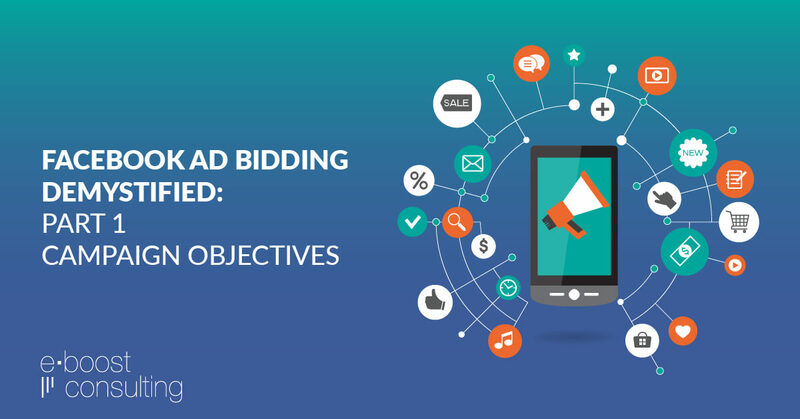 Choosing the right bid type can literally make or break your campaigns. We’ve seen it be the difference between an ad not delivering at all vs driving sales day after day. With hundreds of possible bid combinations, it can be daunting and confusing even for experienced advertisers to choose the right bid, so how does a new advertiser even begin to approach it? We’ll show you all the options here and tell you which bids to use and when to use them. Every campaign on Facebook has an Objective, a Bid Type, and an Optimization Goal. These are the very powerful features Facebook uses to optimize the delivery of your ads to achieve your business goals. If your goals are to get engagement on your posts, you can have Facebook serve your ads to people most likely to comment, like, or share your posts. If your goals are to drive sales on your website, Facebook will deliver your ads to people they deem more likely to make a purchase. Now lets break down each part. Within each of those objective categories there are specific objectives and certain ad types you can run for each. Increase awareness for your brand by reaching people likely to recall your ads. In general we do not recommend running ads with this objective because you can accomplish the same goal while driving more business value using alternative objectives such as Engagement (keep reading…). Reach as many people as possible within your selected audience. With these ads you can select a maximum frequency for your ads which is a nice feature if you’re dealing with small audience sizes but in general we do not recommend using this objective if you are looking for people to take action on your ads. Drive people from Facebook or Instagram to your website or app. Lately we have been using this objective less and less. The traffic tends to be very inexpensive, but also very low-quality. Drive people from Facebook or Instagram to the Apple or Android App store to download your mobile app. These ads are very effective for driving app installs. If your objective is to get new people to install your app, this is the way to go. Get people on Facebook or Instagram to engage with your page or posts. An engagement consists of a like, comment, share, offer claim, or event RSVP. Post Engagement – these work very well for creating social credibility on your posts. Page Likes (Facebook only, not Instagram) – these work very well, just make sure you have a strategy and a reason for buying the Likes. Offer Claims – these are great for local businesses to get new customers in the door with special offers. Event RSVPs – these create buzz around your event and social credibility by driving RSVPs on your event page on Facebook. If you’ve seen ads that open up a pre-populated lead form on Facebook or Instagram, this is the objective they’re using. They’re a great way to drive leads for your business because there is very little friction for the user since Facebook pre-populates most of fields by default. Keep in mind, however, that with the minimal friction you tend to get low-quality leads. You can now run ads that open a Messenger conversation when someone clicks instead of driving them to your website. These are very powerful, especially when paired with a Facebook Messenger bot. You can use these ads to generate leads, drive sales, answer questions, or offer customer support. This is a relatively broad objective and the one we use most often. Use it when you want people to take a specific action off Facebook on your website or app. This could be filling out a lead form, purchasing a product, signing up for a webinar, etc. Make sure you have the Facebook Pixel set up properly if you are going to be using this objective. If you’ve ever seen an ad on Facebook or Instagram with the exact product you just viewed on another website, chances are the advertiser is using the Catalog Sales objective. These ads are extremely powerful because they connect with your Facebook pixel and product feed to serve highly targeted, highly relevant dynamic ads. The goal is generally to drive purchases on your ecommerce site, but you can use them for travel and real estate as well. Did you know you can run ads on Facebook with the objective of driving foot traffic into your brick and mortar business? Use these ads to target people near your address and drive them into your store. So, now you know about all the different Facebook Ad objectives available to you. You also have a good understanding of the different types of real-world advertising situations you might find yourself in that would demand one objective over another. Looking to grow your following on Facebook? Use the “Engagement” objective. Need to drive some more foot traffic to your brick-and-mortar location? Use the “Store Visits” objective. Want to increase your Ecommerce store sales? Try the “Catalog Sales” objective and create a Dynamic Product Ads campaign. With objectives under your belt, check out Part 2 of this series where we explain the budget and bid types available for each of these objectives, what they mean, and when to use them. You’ll be a Facebook bidding expert in no time! Where can i find part 2? Thanks! Enjoy and let us know if you have any questions!